1. Preparate the dough, divide the dough and set one piece aside. 2. Add 3/4 tsp of red food coloring to the remaining dough knead until the dough is vibrant red. 3. 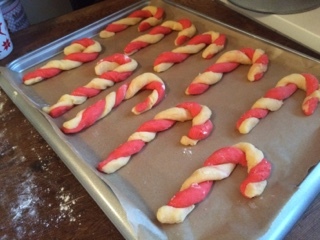 Cover the white and red dough with plastic wrap and refrigerate for at least 2 hours. 4. Preheat oven to 170c/340 f and line a baking tray with parchment paper. 5. Pinch off walnut-sized pieces of dough and roll each into a thick rope about 6 inches long. Pinch the two ropes together at the top and gently twist them together. 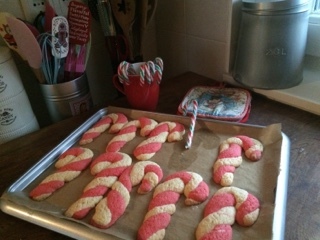 Transfer the twisted ropes to the baking sheet and gently "hook" the top to create a candy cane shape. 6. Place in preheated oven and bake for about 10 to 12 minutes.